Whenever a recipe call for both citrus zest and sugar, I like to pulse them together in my mini food processor for a few seconds to release the aromatic oils into the sugar, intensifying the flavors. The fragrance of the infused sugar is heavenly. The orange and lemon zests add a bright citrus taste to the muffins that partner very well with both the balsamic vinegar and olive oil. I replaced a quarter cup of all-purpose flour with semolina to give the muffins a little more texture and nuttier flavor. 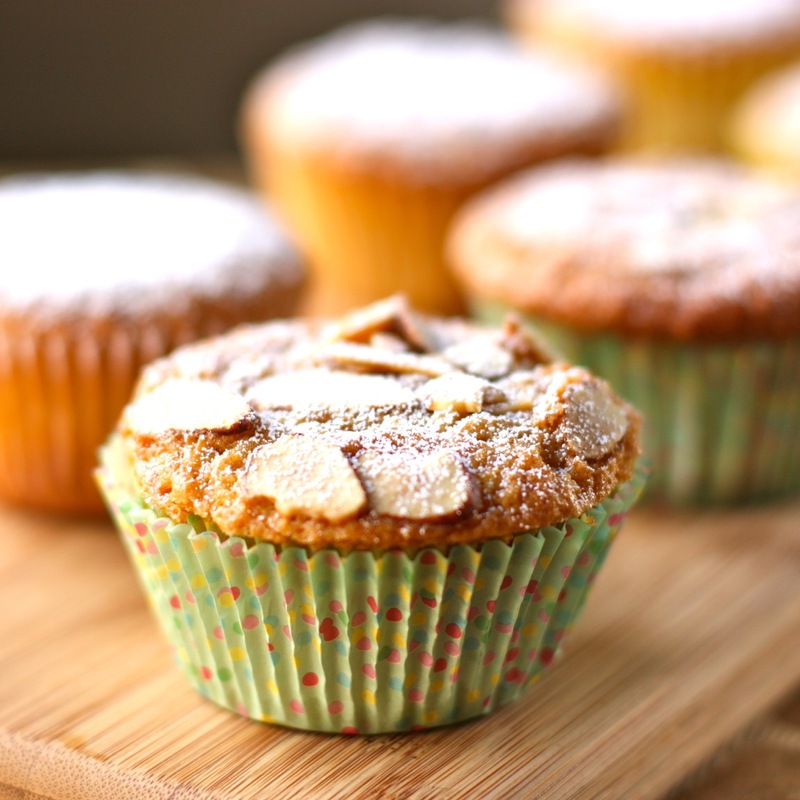 For a nice presentation, use some of the sliced almonds to top the muffins. This recipe really lends itself to variations. Maybe next time I make these muffins, I’ll replace the all-purpose flour completely with semolina. Or maybe, I’ll add some chopped olives and fresh rosemary, or mix in some goat or parmesan cheese. I bet replacing the almonds with pistachio or pine nuts would be good, too. Hhhhmmmn! I guess I’ll have to experiment and report back. Well, at least this week, these will be my convenient breakfast with a cup of Earl Grey tea. Preheat the oven to 350 degrees F. Place paper liners in a 12-cup muffin tin. Optional: Combine the sugar and citrus zests in a bowl of a mini food processor and pulse a few times until fragrant. Set aside. Using a stand mixer with the whisk attachment, beat the eggs a little bit first, and then add the sugar and zests and whisk until pale and fluffy, about 3 minutes. Beat in the vinegar and milk. Add the almond extract. Slowly add the olive oil in a stream, whisking the entire time to fully incorporate and emulsify the oil. Add the flour mixture and stir just until blended. Add most of the almonds in the batter, leaving some to sprinkle on top of the batter, if desired. Crush the almonds with your hands as you add them to the batter and stir until mixed. Fill the muffin tin almost to the top of the paper liners. Top with the rest of the sliced almonds. Bake until golden on top and a tester inserted into the center of the cake comes out with moist crumbs attached, about 20 to 23 minutes. Transfer to a wire rack and cool for 10 minutes. Remove the muffins onto a platter and let cool for 5 more minutes. Garnish with powdered sugar on top. 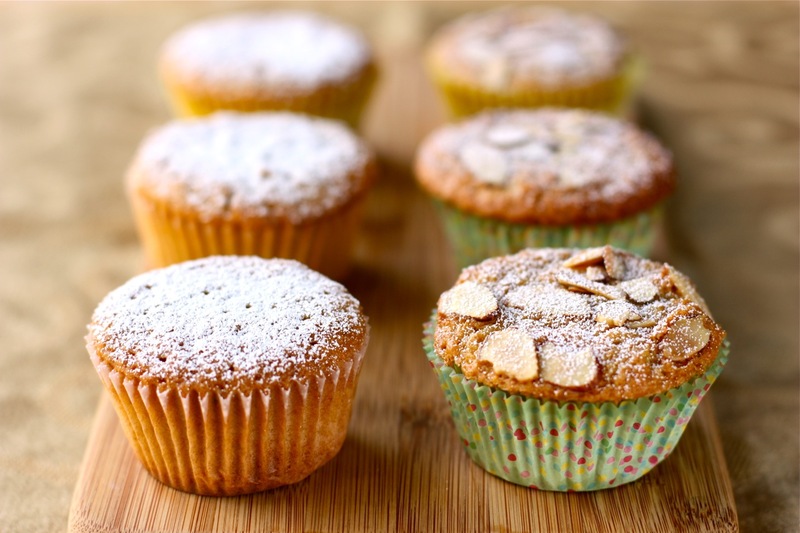 I have prepared these muffins today and they are delicious. Thanks for the recipe! Hi Sonia! Thank you so much for letting me know. I’m glad you are enjoying them. Have a wonderful weekend! what an intriguing recipe list! these look healthy and delicious… and not to mention, gorgeous! Thanks, Katie! I hope you come back. luv it! i will definitely try these! I would love to try these! I adore olive oil in desserts. I would be very interested in seeing your spin on these muffins.